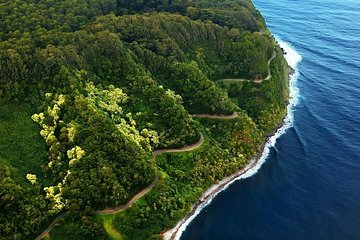 Salte de la isla de Oahu a Maui y vea una segunda isla en un tour de un día lleno de acción. Perfecto para los visitantes que tienen poco tiempo pero desean experimentar algo de la magia de Maui. Su guía narra mientras viaja a través de la isla en un minibús con clima controlado, que se detiene en muchas atracciones durante el día. Vea el bosque tropical y las vistas de la cascada, pruebe las delicias locales y deténgase en la encantadora ciudad de Hana. Mantenga su cámara a mano para las oportunidades de fotos. At the start it seems to be a little long but step by step the tour becomes more and more amazing even for teens 13 and 15 year old. Changes in landscapes and fantastic views are incredible! So beautiful and changing at every turn of the road. Bjorn was the best possible guide. Incredibly knowledgeable and entertaining at the same time. Thank you for that! The excursion was very well organized. The guide was very knowledgeable. The Road to Hana was both beautiful and nail biting. I'm glad I wasn't driving, but the experience was great. Highly Recommended. The tour was great! Our driver/tour guide Bjorn was wonderful! He presented all the ladies with a flower, and provided cold beverages non-alcoholic for us. We stopped at the black sand beach, which has a lava tube you can walk through. Saw many waterfalls, fantastic views of the ocean, a ton of different plant life, saw wild goats, tried the local homemade banana bread, stopped at a church which is also where Charles Lindburgh is buried and another gentleman that raised monkeys like family. The road to Hana, and the drive after reaching Hana, provided such a scenic view of the wild, untamed, undeveloped parts of the island. Bjorn provided an amazing amount of information about the island, plants, buildings, history, culture, etc. I wish we could've stayed at some of the stops more, but the tour gave me a great taste of what the island has to offer. My goal is to make another trip and stay longer. Very interesting. Long day but unique experience. Our driver was knowledgable but after several hours of talking began repeating his jokes over and over. Glad I did it once. Excellent guided tour of Maui by Bjorn. Bjorn was very knowledgeable and entertaining. Roads are very narrow in parts of the island, so we were glad we had an experienced driver! Definitely would recommend to anyone but especially island hoppers!